Just one week remains in the Intermountain Conference football season, then four of the eight teams move on to the Class 5A Oregon playoffs, which this year begin in the round of 16. Four 5A leagues will each send four teams to the playoffs, so who is going from the IMC? Summit (6-0) – Secured their second-straight league title. Bend (4-2) – Win and they are in with a 5-3 record. Lose and they are tied with Mountain View with a 4-3 record. Mountain View would win the tiebreaker based on head to head. If they lose and Redmond loses they are in as they hold the tiebreaker over the Panthers but don’t over the Hermiston Bulldogs. Redmond (4-2) – Win and they are in with a 5-3 record. Lose and it could get complicated, see below..
Hermiston (4-2) – Clinched playoff spot with wins over Bend and Mountain View. Mountain View (3-3) – Can still make the playoffs with a win over Bend high. Lose and they are out. Pendleton (2-4) – Eliminated. 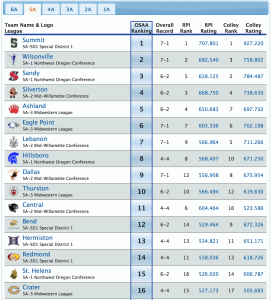 Beating Hermiston would clearly mean a lot, but won’t get them into the playoffs. Ridgeview (1-5) – Eliminated. A chance to end the season on a high if they can upset crosstown rival Redmond. Hood River Valley (0-6) – Eliminated. Would have to upset No. 1 Summit to avoid going winless on the season. What happens with a 4-way tie for 2nd? 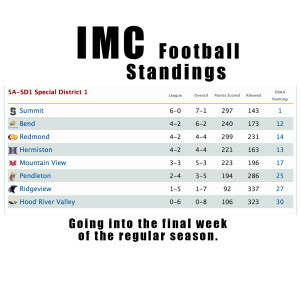 It’s possible that Bend, Redmond, Hermiston and Mountain View could all go 4-3. This is unlikely, as Redmond should beat Ridgeview and Hermiston should beat Pendleton. Bend is favored over Mountain View, but that game could go either way. If they all end up 4-3. Hermiston would have the edge over Bend and Mountain View, but not Redmond. Redmond would have the edge over Hermiston and Mountain View but not Bend. Bend would have the edge over Redmond but not Hermiston and Mountain View. So, yeah, I don’t know actually. But I think that Mountain View would be the odd team out? But don’t quote me on that. 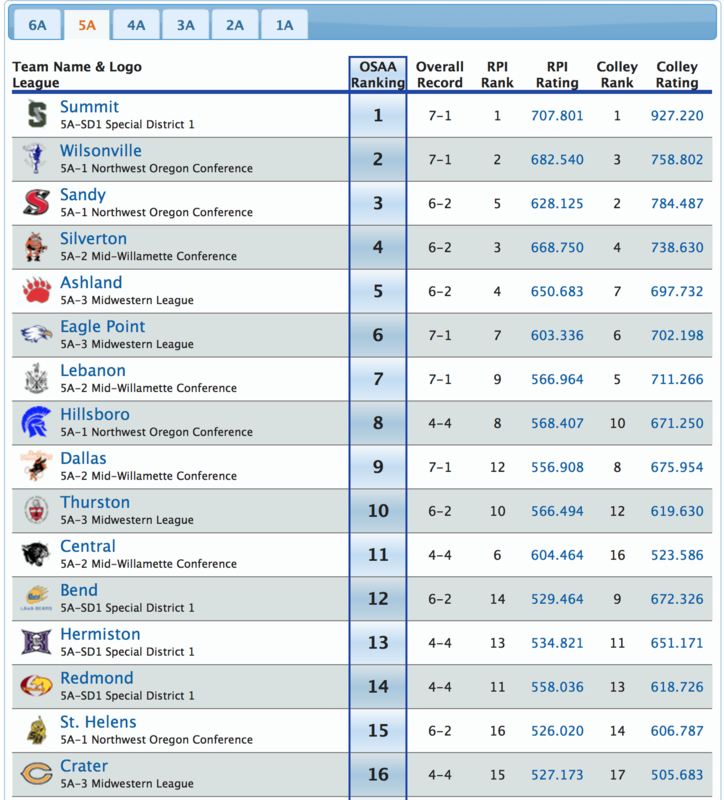 Top 16 OSAA Power Rankings. Mountain View @ Bend 7pm – Rivalry game. Redmond @ Ridgeview 7pm – Rivalry game. 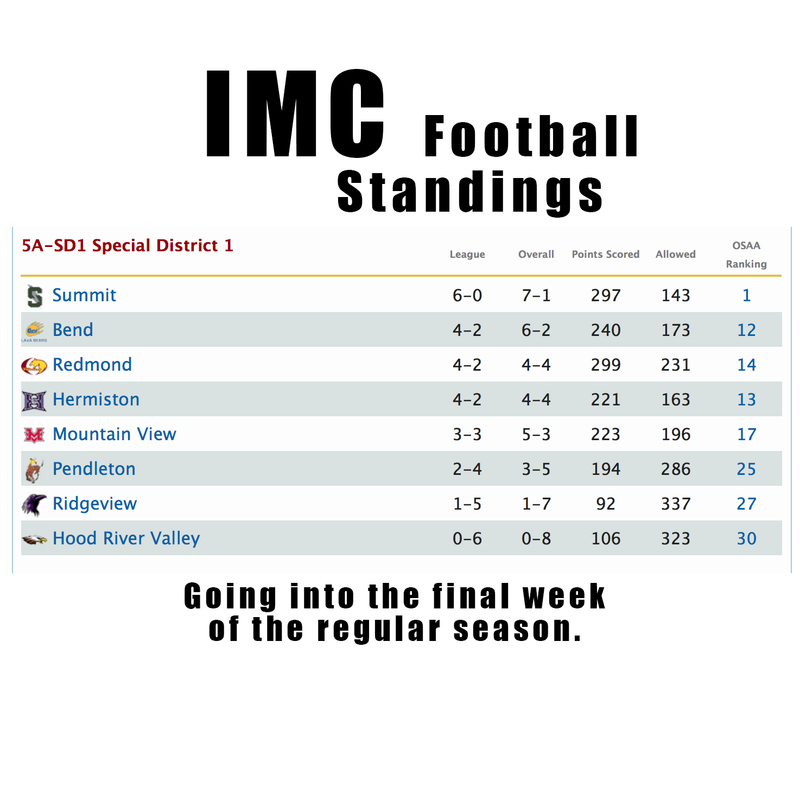 Summit @ Hood River Valley 7pm – Top team in IMC versus bottom team in IMC. Hermiston @ Pendleton 7pm – Rivalry game. This entry was posted in Bend, Football, Mountain View, Redmond, Ridgeview, Summit and tagged bend, football, hermiston, hood river, IMC, mountain view, pendleton, playoffs, Ridgeview, summit. Bookmark the permalink.